Please order me ten of these, thank you. We're often told that it's important to listen to other people's viewpoints, to try and understand why they think a certain way, and to empathize with people whose opinions could certainly be considered problematic. But honestly, what if we were real with ourselves and just made peace with the fact that some people should just shut up. Aaron is a 17-year-old Houston, Texas student who told Buzzfeed that he had experienced homophobic bullying in the past. 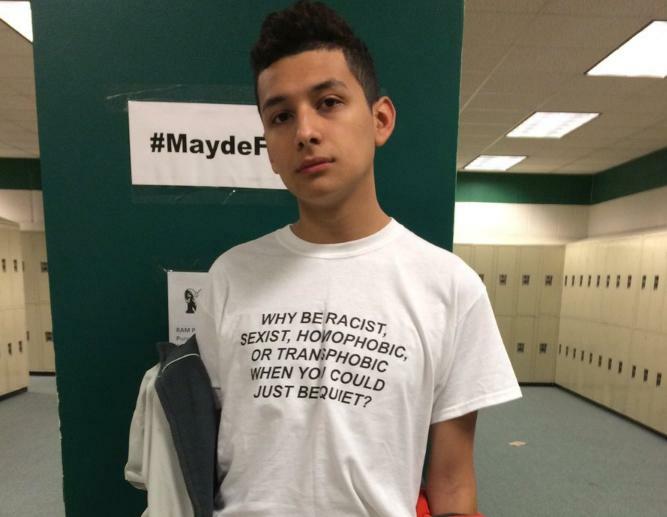 Aaron clearly feels strongly about using words to discriminate so he wore a t-shirt that plainly expressed that he was 100% not down with racism, sexism, homophobia, or transphobia. Predictably, the internet is INTO IT. Pretty much everyone is wondering where you can get this tee. An Etsy shop called Green Box Shop is the major key. But, we should also point out that the original phrase is actually a tweet by twitter user @yikesbrandon. Kudos to Aaron for wearing this very important opinion for everyone to see. BRB, though. Just gifting this tshirt to everyone I've ever met.